It's Only Greek for Me | Ellen Says Hola! This story is part of a series, Gondola Life. 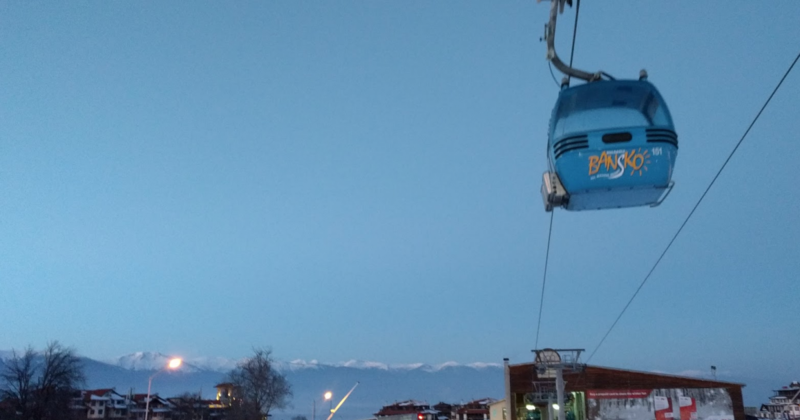 Every morning to get up the mountain in Bansko, we share 30 minutes in a cramped gondola car with a few strangers. Then when the day is over, we do it again. This is usually a pretty silent affair — people are tired going up and exhausted coming down — but sometimes the atmosphere is just right, and we get a glimpse of other lives on the mountain. I am pretty spoiled while travelling because usually, everyone speaks a little bit of English. Usually. At the end of a this particular day I rode the gondola down the mountain with a Greek couple and an Italian guy. There were maybe — maaaaaybe — two dozen English words and phrases between the three Europeans, and even fewer Italian words from me. And zero Greek from anyone but the Greeks. This was not going to stop John (half of the Grecian couple), from getting to know us! I attempted my limited Italian — my best phrase is “I only speak a little Italian” followed by members of a family tree — and then my brain kept trying Spanish words instead. None of this was helpful. At the halfway point, we were joined by a tiny, shy, Macedonian student here with a school trip. I know this because John enthusiastically stumbled his way through all of his English words again, and she replied to his questions in short, startled, perfect English sentences. We clomped our way out at the bottom with waves and hopes that we’d see each other ‘Toomoorrow!’ on the slopes. Then parted ways. I’m pretty sure John was drunk. Always good to end the ski day slightly drunk, I say. Would definitely improve my Greek. Happy skiing (or boarding).